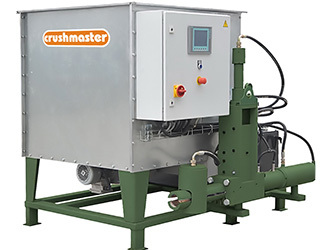 U-series briquetting presses are designed for briquetting wood shavings, sawdust and other waste like EPS. Through this operation not only storage and transport costs will be reduced, but the final product-briquettes are also a valuable fuel. Depending on the throughput and material, the briquetting presses can be individually adapted to various tasks. Virtus Equipment briquette presses handle various materials like wood, paper and cardboard, and biomass and turn the waste into small, compressed briquettes. Without the use of any glues or adhesives, the press creates a solid briquette which looks similar to a hockey puck. Machines can be designed for different briquette sizes and individual briquette shapes depending on the application. All models are noted for their robust construction as well as low maintenance technology. They can also be optimally integrated into your existing production line. Briquetting waste materials can reduce volumes by up to 90%. Briquetting also allows you to save money on expensive storage and production space in addition to the production of high quality secondary raw materials and briquettes are high in heating value. Briquettes are easier to store, lower an operation’s fire risk, decrease transportation costs, and reduce the fine dust and pollutants through the compression of shavings and dusty materials into clean, compact briquettes. Virtus Equipment’s briquetting machines offer an economic alternative to costly fire prevention measures because the process greatly reduces the danger of fires and explosions in the warehouses and on shop floors by briquetting and consolidating potentially flammable waste into compact entities. Permanently rotating agitator with discharge screw for transporting material into press unit. Dustproof filling chute with sensors. Optional oil cooling for hydraulic system.